Two MDivs and two PhDs, all dressed up in their gaudy academic gowns, were puzzled over the Hebrew letters. (Mene, Mene, Tekel u-Pharsin). Instead, we found “MMTWM, NNQPY, ‘ ‘ LRZ.” I asked my colleague, Dr. J, to help me out. There remains, however, the question of why it is written vertically. Nothing I’ve been able to turn up online gives any indication that Aramaic was written this way. It’s a right-to-left script like the Hebrew whose characters it shares. The mistranscribed letter is the one at the top left of the inscription, which Rembrandt has taken as a terminal mem, ם, but which should be a samekh, ס. The close similarity of form makes the mistake understandable. I do not think the National Gallery is correct about the vertical arrangement being the result of mere ignorance, however. 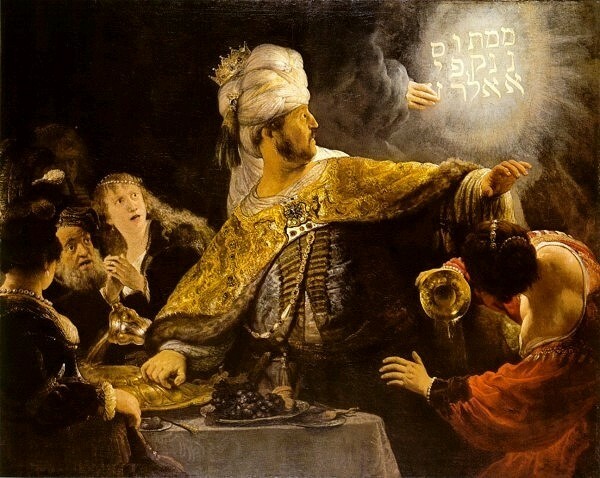 A more plausible suggestion is that Rembrandt here follows a Rabbinic tradition. Aramaic was the lingua franca of the Babylonian court, so there should not have been any reason for Belshazzar or his priests not to be able to read the inscription. Says David Kahn, “It seems strange that the Babylonian priests could not read what was essentially a plain-language message.” The Rabbis cited in the Babylonian Talmud give various suggestions to explain this failure: the inscription was an Atbash cipher, or the forms of the characters were unusual in some way. Rembrandt follows another Rabbinic suggestion by writing the words vertically. This has some unflattering implications for the intelligence of the Babylonian priests, but then, the Rabbis are not shy about insulting the intelligence of the pagans: the name of King “Ahasver,” for instance, is still a Jewish way of calling someone a fool. As an attempt to render the inscription incomprehensible, vertical writing may not seem to be a tough enough “cipher” to be a historically plausible explanation. Yet it seems to have worked on the sopherim of Mars Hill, at least for 5 minutes. Kids can always surprise you!!! I had one that told me how much he hated Latin and then chooses to “hate” it so much he got a Ph.D. in it!!! Go figure!? A perfectly delightful anecdote. Brought home how much I truly do miss being there. Kanji, (as I know it) the Chinese ideagrams also used in Japanese writing (along with the simpler, phonetic hirigana and katakana) may be found written either vertically or horizontally. Things Only Talia Cares About. Donate through SAMS to help us continue to serve in the Philippines.